If in the 1960s London was said to be swinging, then Andrew Révai, or The Doctor as we referred to him, was to have none of it. With a calm, if forbidding, authority he presided over an empire which bore more resemblance to a gentleman's club than ever it did to a highly successful art publishing house. The Pallas Gallery at that time occupied the second floor of a house in Albemarle Street in the heart of London's Mayfair. Affiliated in some unspecified way to The New York Graphic Society, it was the brainchild of Andrew [or András, for he was a Hungarian emigrant] Révai and his partner Robin Chancellor. As the Bright Young Things of our day we danced in decorative attendance, mere Pucks before Oberon, whilst the great and the good of the contemporary art world glided in and out of those closely carpeted, eighteenth century rooms. They were all there: Hitchens, Moore, Nicholson, Piper and Sutherland, their work joining that of Dufy, Eisenmayer, Kokoschka, Soutine and Vlaminck, paintings propped, paintings positioned, but paintings rarely hung. And we, the callow youth of the day, so much more interested in the occasional appearance of Daniel Carroll, famous then as Danny La Rue, who, in pursuit of one of our number, Jimmy, would emerge from the lift flourishing bunches of beautiful flowers. Graham Sutherland, at the time having completed work on the tapestry for the new Coventry Cathedral, was the most frequent visitor, no doubt on account of the publication of 'Christ in Glory in the Tetramorph. The Genesis of the Great Tapestry in Coventry Cathedral', a dialogue between Andrew Révai and the artist himself. But all of that is now a long time ago. The play is over and we, the shadows on the wall, are since dispersed. Or so we thought. Yet as recently as a year or two back, through a mutual friend, Robin Chancellor invited us to see the daffodils in the park at Stoke Bruerne in Northamptonshire where he continued to live in the handsome Inigo Jones pavilions which he, and Andrew Révai, had so lovingly restored some fifty years before. What is left now are the memories. 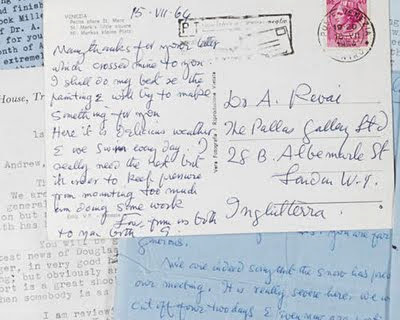 Memories revived yet again earlier this year when Bonham's put up for auction a collection of letters, a correspondence between Sutherland and Révai. Such a strange, small world! N.B. Whilst we shall remain in touch with our Followers and friends over the coming week, travel through Europe may delay the timing of our next post. How I love my visits with you and with a world and often a time that is so different from my own. So while you are touring Europe, Helen will be trekin' down HWY 127 for the World's Longest Yardsale - who will see the most oddities, I wonder? We too enjoy being part of your universe, so interesting we think when worlds collide! Too close to call on the oddities....we shall, no doubt, compare posts!! What a lovely post that so evoked a world a whole time away. How exciting to be part of such a talented & glittering crowd, some romance and beautiful memories on a strange weather day in Worcestershire. I must agree that the 60's in London were wonderful days; probably my greatest memories. I knew Ivon Hitchens and his lovely wife. What a very good painter he was. Yes, in some ways it all seems like another lifetime ago, in others, it could be yesterday. Some people have such strong personalities that they stay with one always. "the Bright Young Things of our day"
How really splendid that you too experienced London in the 1960s. Was there, at the time, a more exciting city? We are, of course, delighted to learn that you knew Ivon Hitchens. The Pallas Gallery, for which we still have a catalogue dating from all those years ago, published several of his works as prints. We agree - he was, along with the others, an exceptional painter. Ah, if you had known us then!! Probably more Mod than Rocker! What a wonderful time you and your friend's must have had back in the '60's. Mayfair is where I worked in the late '60's, early '70's and was my stamping ground. There must have been times when I walked passed you, all of those years ago !!!! You moved in a circle of such interesting and talented people and I think that there are many, many more of your stories and memories to come.....and, how I look forward to more of them. You are, perhaps, beginning to know us a little too well!! At the time it was all rather glamorous and one did meet all manner of interesting people but, as mentioned, knowing Danny La Rue was, or so we thought then, way more interesting than a handful of artists. 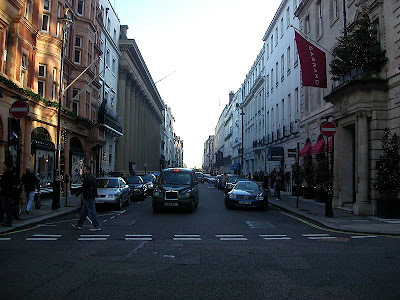 What fun to think that we might well have passed each other in the street, or sat at the next table in some sandwich/coffee bar like the one in Dover Street [Piccadilly end] where we often went at a lunchtime. Certainly all manner of interesting people came and went in Albemarle Street at that time, but then London was filled with them. You are always so very generous about our posts. Thank you. The kindness is very much appreciated. I am getting addicted to your esoteric posts, they resonate my inner chords :) Thank you. Do you find any difference in the art scene of then and now? This is very generous of you. It was, as you may imagine, wonderful to have come into contact with such brilliant artists, sadly all of them now dead. Here in Budapest, as docents at the Contemporary Art Museum, we have been most fortunate to have had the opportunity to meet with many of the leading artists of today. What is particularly difficult for them is trying to establish a reputation on the international art scene, rather than just within Hungary. I just love your posts. I never know where we will end up next. My brother experienced the 60's scene in London, he was at art college, the right place to be at the time. How wonderful it sounds, do people really know how to enjoy themselves properly anymore do you think? Then it was a way of life, we all seem so worried now! PS: Have a great trip! It is so very kind of you to write in this way. We shall, from now on, attempt to conceal from you that we are Mr. and Mrs. Average shopping at Marks and Spencer, driving a Ford Fiesta, holidaying in Benidorm and living in Surbiton. It is true that by the 1980s life did become a little duller but by then we were all drinking more [so at least the years passed in something of a haze]. Thank you. We shall as always enjoy the experience of crossing Europe, or at least part of it, as we travel back to the UK. I understand Susan T's comment, we do all seem so worried now. I woke this morning with a renewed desire to get past that and go about creating more joy, more fun in my life. Blogging is wonderful, but I need to move more, get out and around and see what's outside the boundaries of my six acres. The circle you moved in seems fascinating. I hope we'll hear more. Thank you too for such a generous remark. Your brother at art college in London at the time was, most certainly, where it was all happening and there was such fun to be had without, it seems now looking back, having very much in the way of money. We agree, it does seem that people no longer know how to enjoy life - which is really rather sad when we all have so much in the way of opportunity. With six acres to look after, Teresa, we really do wonder that you have time for anything, let alone your own wonderfully varied and informative blog. But, as you say, it really is so very important to make the most of every single day and to enjoy life. For us, above all, we do so enjoy the company of friends and meeting new people who, one always hopes, will become friends. Th pavilion is one of a pair, what remains of a much larger house, but which, since Robin Chancellor's death at the end of 2010, now seems to be taken over by a company as a venue for weddings. Such a pity. We do think that you would love the pavilion, and so many similar houses to be found in Britain. Perhaps a visit one day? London in the 60s was such an exciting place to be. But we were young then! Ah, those really were the days! The works of Jean Dufy is great, so full of life! In the 60's I was living and working in NYC, fortunately meeting some rather intriguing people myself. It was an exciting time. I have a book recommendation only because your post reminded me of an earlier time when artists and their friends came together not in England but in France. THE SORCERER'S APPRENTICE: Picasso, Provence and Douglas Cooper by John Richardson. We do agree, Jean Dufy's work, and that of his brother, are so full of light and movement. 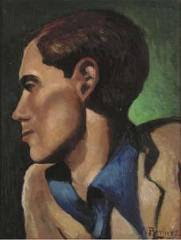 There were so many of his paintings in Albemarle Street at the time. We wonder now what became of them all? I'm sure your dancing in decorative attendance was carried out with exquisite grace, and that others would have said they danced attendance upon yourselves and were honoured to know you. How appropriate to reunite with your friend Robin across a sweep of daffodils. Before anything, thank you so much for the book recommendation which we are sure we shall find both of interest and enjoyable. We shall seek it out when we are in the UK and add it, hopefully, to our stockpile in readiness to bring back. New York must in the same kind of period been very much an alive and fun place, We suspect that it still is whilst London, we fear, has become somewhat dull. Such a very generous thought, Yvette, but the blog is no more than that. However, it does allow us to 'meet' such very varied and interesting people, such as yourself, which we enjoy immensely. Having written about a dozen gardening books, translated into many languages, we have dipped our pen into the ink for the last time! Or so we think...! Such an interesting post. Your live was/is so different from ours. All those important people you have met, places you visited. You must both have a huge suitcase full of memories. I hope you will share some more with us. How delightfully you express yourself in this more than kind comment for which many, many thanks. But, dear Mise, we were in those days, as stated, mere shadows, and each one of us, rather shamefully, more concerned with self and appearances than ever we were with what has transpired to be great art which passed before our eyes. But your own life, and we discern this from your wonderful blog, is full of interesting events and people. We recall, only recently, a marvellous evening spent on the SS Rotterdam. Now that we should love to do. As always we shall enjoy our overland journey back to the UK for, as you will know, we pass through so many lovely countries. Your post are always so fun and wonderful. Richard from My Old Historic House. What a glorious time it must have been! There is something magical about looking back on that time in our lives when were the Bright Young Things. We see our young selves with the wise eyes of experience, and we wonder, oh, the wonder! What a lovely evocation! Sadly I only know those times from reading about them [I was a child in the US in the '60's]. The Inigo Jones pavilion is super--the building has lovely balanced lines. Thank you so much. We are pleased that you enjoy them. In return, we derive huge pleasure from your own blog, packed as it is with the most splendid treasures. Oh the wonder, yes, but also, with hindsight, the embarrassment of youth! But they were, as you may imagine, rather fun days when, of course, the world really was our oyster. what a lovely post sharing distilled memories of an energetic youth with us. i loved the dufy you chose. always fresh and vibrant his pieces are. enjoy your european summer adventures. But to have grown up in the United States - how we should have loved that for, as children of our generation, America really was the land of our dreams. And yes, the Inigo Jones pavilions, for there are a matching pair, are most elegant. They were days of great fun and great irresponsibility for we had few cares or worries and had only ourselves to think of. Perhaps somewhat selfishly, but we do hope that was not the case. Thank you for sharing your memories of a part of London that I never knew about. What a wonderful, colorful life you have led! I wish you many new adventures on your vacation and hope you come back with more stories to share with your loyal followers. I will be waiting. This is such a WONDERFUL post. I am afraid i was born in the 70's so my knowledge of the great artists you met comes from books and their art works. I can only imagine how exciting living in Londn in the 60's was (although in my opinion living in London is always exciting. It can never get boring). As for Danny La Rue - your description of him is just devine. I remember hearing of his death. I guess you have so many more interesting stories to tell and i can't wait to read your future posts. You have inspired me to leaf through my art history books and look at Dufy and Kokoschka again. Thank you again for a great post and enjoy your travels through Europe. Arleen, you are very kind. Over the years we have met and enjoyed the friendship of so many interesting, creative and lively people and so the stories we can tell are legion. And, we are pretty sure that after our travels we shall have yet more to share with all our friends and Followers of whom we are so fond. And i forgot to say, in my opinion Puck had much more fun than Oberon! We are so pleased that you enjoyed the post and thank you so much for your enthusiastic response. Yes, we agree, although London's star may shine more brightly at some times than others, there is always a magic and an energy about the city which makes it such an inspiring place to live. Just as our own memories of the gallery and all its goings on were rekindled by the letters, we are delighted to think that you might be tempted to relook at your art history books and review the works of these, in our view, most marvellous of artists. And as for Puck....well he continues to have fun!! What a host of names to conjure with from London in the 60s, and how fortunate you were. Alas we were living in Scotland, where the swinging 60s just passed us by. The world was so much bigger then and London seemed to be a million miles away. Enjoy your travel through Europe. You are so right that the world seems to have shrunk considerably in these ensuing decades. Technology has closed the gap and so much more can be experienced in one's own home without the need for travel. The 1960s were heady days indeed, just the thought of them is tiring now. Puck, come hither!! It is my honor to have met you as we travel through this strange, small world. And how lovely that you were invited to view daffodils. No, dear Suze, it is we who have the honour to know you and to have insight into a mind which is ever alert, receptive to new ideas, creative, reflective and, above all, intelligent. Your blog, which enriches all of our lives, pushes boundaries we can only marvel at. But to the Mass and what it means to us. Perhaps one day. But not here. Surely we shall meet, as we earnestly wish, and then there will be tales to be told. And what fun it will be. But we digress. Thank you for a lovely comment. Thank you so much. It is more than generous of you to say. Alas, we shall not reach any part of Scandinavia on this occasion as we are travelling back to the UK. But yours is a country we should so enjoy visiting so perhaps one day. We very much hope so. And thank you for such a kind thought. Thankyou. I know I can come to your blog and find something stimulating. This time, I've been keen to find out about Graham Sutherland and what transpired at Coventry, how its reconstruction symbolised the reconstruction of a community after devastating loss. 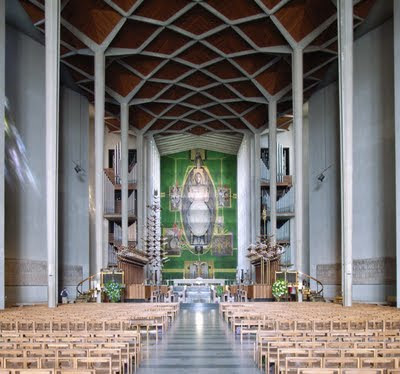 We first visited Coventry Cathedral in or around 1970, not many years after the building was completed, and subsequently attended many services and concerts there. It is wonderful as a modern building not only on account of the Sutherland tapestry, but also because of the work of other notable artists including John Piper. The ministry in those early years, when the memory of the bombed old cathedral was still fresh in the minds of so many Coventrians, was on reconciliation. Hope you kept diaries! I visited Coventry cathedral a few years ago and was sad to see it looking rather neglected - that tapestry needs some attention. There was nothing in the cathedral shop about the building of the cathedral or the artists who participated. I wrote to the Dean about it but got a holding reply saying he'd reply when he returned from holiday. I'm still waiting - perhaps he takes long holidays. I didn't follow up - perhaps should have done. This saddens and disappoints us greatly. As we commented to Faisal [Gardener in the Distance - see above], we knew the Cathedral in its very early days when it really was an extraordinarily fine, modern building and was a centre for both the spiritual and secular activities of the City. We were last in it in or around 1980 since when, it would appear, it has not stood the test of time. The Dean's rudeness, for that is what it is, is inexcusable. The cult of celebrity is not new then Jane and Lance? In my memory at least, DLR was a frequent visitor to our shores. The pavilion is beautiful and in a wonderful setting. I love reading your wonderful tales but never feel I have anything interesting enough to say in reply! Just want you to know that I always read your posts and enjoy them immensely. Have a good trip back to the UK. No, you are right, nothing really new here except that in the past the 'celebrities' tended to be famous for having achieved something or other. Today they are famous for being famous. Sad old world! DLR became quite a household name. We are not sure quite what became of Jimmy whose surname escpes us after all the years. And thank you, Andrew, for the very kind comment and link on your post. It was, and is, much appreciated. I am sure London in the 60's had to be a very wonderful and remarkable time, as I remember all the influence coming over from across the pond! Music, fashion, etc. We are always delighted to hear from you, Marina, and welcome your comments, which are, in fact, of interest to us along with all others. Your own blog we continue to enjoy enormously both for its wide range of interesting topics as well as for the highly desirable, in our book, vintage items. It was, as you say, an enormously creative time and one which, as far as London is concerned, has never wholly nor completely returned in quite the same way. And thank you so much, Barbara, for the good wishes for our journey back to the UK. Oh, Linda, as always you say the nicest of things and always make us feel so very special which, we do assure you, we are not. And in those days, before the advent of the top banana, we had to make our escape on, we are afraid to say, the Piccadilly Line! Jane and Lance --With each of your posts I feel I am allowed into a very special place and time. Thank you for such lovely visits. Enjoy your travels and be safe. Lovely memories and happy travels. Thank you for a unique and fascinating peek into those brilliant London years. What an enchanted life you both lead -- and what a beautifully-written post. It is such a privilege, is it not, to have mingled with the eccentric beau monde of London in your youth? Surely you both shone with the best of them. May your travels prove equal parts enriching and relaxing. I have devoured that 3rd sentence in the 2nd paragraph no less than 4 times, because it is so deliciously written. Pure poetry. And memories? Oh but they are the fondest of dreams, the magic fairy dust which sprinkles our thoughts, sweetens each day and provides happy company for tomorrow. At the time it did not, in any way, seem at all special for it was just a part of everyday life. Looking back now, years later, perhaps we should have been more appreciative, and had greater respect, for those who crossed our paths. But we were young!! How we should wish that all your mornings were like that of Christmas. But if this cannot be actually so, then we trust that it may be the case in spirit. Thank you so much, Jason. They were indeed times of interest, and fun, and we should not have wished to miss out on them. How aptly you put it for they were years of 'brilliance' in every kind of way. And London, at that time, was the home of so much creative energy and talent. Looking back, Alcira, it was most certainly, as you say, a privilege although we little realised how much so at the time. But, since then, we have been most fortunate to meet so many very interesting people, many of whom have become and remain firm friends. This is such a very generous comment, Virginia, and one which we much appreciate. But we love the way you here describe memories, particularly for the way in which they provide 'happy company for tomorrow'. Now that IS poetry! People are endlessly fscinating, we find, and yes, we think ourselves to be very fortunate to have met and befriended so many highly creative individuals. I look forward to further posts regarding the things you got up to in the sixties... and I'm loving the letters. Whether we can reveal all is something you will just have to wait and see. Correspondence we find to be a most interesting way to learn more about particular people at a certain period in history. If only one has the space to keep all this memorabilia, what intriguing tales might be told in the future!! With every post I feel that I am beginning to know you better ..... you have led such interesting lives, and are sharing with us your memories of fascinating people. I have seen the quite stunning Sutherland tapestry at Coventry Cathedral many times and (as a non religious person, not claiming to unserstand the significance)every time am amazed by the exquisite detail I see. I read somewhere that Sutherland only ever saw the finished work once and then was heard to say something like " it could have been worse!" London in the 60's must have been an exciting place. I’ve learned London/Britain has been a class society while having liberty as its core value. You seem to have had graceful experience. Japan was in the rapid growing period after the devastation of WWII. At the end of the 60's, I was in my teens, but still remember that the 60's were a revolutionary, turbulent time of great social and technological change: new musical styles, civil rights, women’s liberation, the first man’s landing on the moon, flower children, Vietnam War, student movement....etc., etc.. I loved Italian, French, British pop music in 60s... you made me nostalgic. I like the photo of the pavilion with its reflection on the water and water lilies. I always thought Europe to be impossibly large, and filled with extraordinary (to an Aussie girl) numbers of people - but your posts are showing me it's actually quite small and interconnected!!! We like it very much when we can begin to imagine the characters behind the blog and we are pleased that you find this too. We rather like the thought that Sutherland could have said ,"it could be worse", certainly not something we knew previously. It is many years now since we were last in Coventry and, in writing this post, we now feel that a visit is, perhaps, long overdue. We can only imagine what life was like in Japan in the 1960s but can well appreciate the radical changes and reconstruction which must have been taking place. Yes, as you say, so many areas of life, fashion, music,attitudes etc. etc. had changed beyond all recognition by the end of that decade. The Beatles were our favourite group, closely followed by the Rolling Stones. Even now, just a few bars of their music can transport us back to those days of youthful freedom in an instant. No, surely, it is Australia which is impossibly large, although we have never been!! You have hit upon amost interesting point here and that is all the interconnections across Europe. For us, this is an endless source of fascination and interest as the lives of Royals, commoners, landed gentry and the middle classes all somehow can be traced back and linked to our own distant family members. Such a small world!! Ah, who doesn't love some nice, old, parchment letters? It does sadden us somewhat that the art of letter writing seems to be withering on the vine in comparison with the rise and rise of the email. Will these really provide the same interest as the old parchment letters of the past? London in the 60s is looooong before my time, but clearly nothing to be ashamed of, and how interesting to have mixed with the glitterati of their day. (I avoided the use of "sleb", because indeed it is only a modern invention, who's participants thrive on exposure of a kind quite different to that I associate with the 60s!). Your post comes at a time when I was reminiscing about days in London, including a luncheon at White's, where I met Douglas Fairbanks Jr, (some of who's possessions I was viewing at an online auction in New York last night). It sounds like it was such a fun time and what amazing people you rubbed shoulders with! What an interesting read those letters would be! email is wonderful in so many ways but I do miss letters and the beautiful papers they were written on arriving in the post. Mind you I was always a hopeless correspondent! It is amazing how even people who were not alive in the 1960s or indeed were nowhere near London still can picture what life was like then. Its influence seems to have been global and timeless. How interesting that you met Douglas Fairbanks Jr. whom we remember as the swashbuckling hero of 'The Mark of Zorro' and now have a mental image of him, standing on the table at White's brandishing his cutlass. But, perhaps it was not quite like that?!!! Such poetry! And such beauty! Yes, they were such fun times and the atmosphere of the day seemed to encourage creativity and invention. We totally agree about receiving letters in the post, such excitement and always something to return to and savour at other times. However, we are as guilty as the next person of using email for speed. Thank you for such a kind comment. We are always delighted to hear from you as we regard you now as a near neighbour!! Hello you two Pesti's again. I often ask myself whether future generations will look back with marvel and reflection at some of the art works and contemporary architecture our current millennium generation has produced. The much admired and celebrated artists, whom you have posted about here, brought so much more depth, substance and splendor to their work than appears to be evident in much of the work produced by many artists of today. I can only imagine how much pleasure you took from your visit to see the daffodils in the park at Stoke Bruerne in Northamptonshire, that day. A wonderful experience for you both to cherish. Talking briefly of 'shadows on the wall' again - I am in the process of researching a period in the life of the great marine artist 'Montague Dawson' on behalf of one of his relatives down in Australia. He and his family lived in a large Victorian Villa on the waterside in Hythe, right next to the pier you commented about earlier, with dramatic views across Southampton Water to where the Titanic was berthed before embarking on her tragic maiden voyage. Thanks again for your fascinating comment on my latest scribblings yesterday. I had to disappear yesterday evening, straight after posting, so I've since pasted up a sizable response to your various remarks and observations for you to take a look at, once your feet have touched the carpet again later. Thanks again for providing us all with such an elegant posting here again. Safe journeying to you both. P.
Welcome back! Certainly these were stars of their day even though one did not pay them the attention that, with hindsight, we definitely feel that they deserved. And, although we are aware of so many brilliant contemporary artists, we do feel that there is a great tendency these days to laud the mediocre if publicised well, whilst the silent splendids go unnoticed and unrewarded. Oh, to be rid of 'slebs'!! We do know of Montague Dawson as his work was published as prints [possibly by Frost and Reed of Bristol] and was certainly sold by Leonard and Clarinda Peto who ran a Fine Art shop in Manchester Street, Southampton, with whom we had a great friendship. But this was probably well before your time, although we think that the rather nice terrace of Georgian houses, where the shop was situated, next to the bus station remains. It's interesting, isn't it, how decades mirror certain generations. I was getting out on my own in the 1960s, and am grateful to have been on the scene of so much vitality and change. Those were the best of times, we do so agree. A dose of the optimism which was all around one then could come in very useful today, we feel! Must come back once more, as I've now perused the comments, where I see you wrote "Here in Budapest, as docents at the Contemporary Art Museum, we have been most fortunate to have had the opportunity to meet with many of the leading artists of today. What is particularly difficult for them is trying to establish a reputation on the international art scene, rather than just within Hungary." So, then, your days of new art are far from over. I hope you'll one day write about some of these artists. We are so pleased that you have enjoyed the comments as well as the post. For us, developing the dialogue through comments is a source of endless fascination and interest. And yes, you are right, we have many stories to tell of contemporary Hungarian artists whose work has often been shaped by the extraordinary cultural and political situations in which they have lived. Until we came to Budapest we had not heard of any of them, nor seen any of their work, so we now have the opportunity to try to rectify this for others. Ah, now you're making me nostalgic for London. The art, the color, the theater...spectacular post! They were indeed most exciting times in which to be in London. A few years ago we sold a flat which we still had in London, and so now our ties with the capital are severed. Oddly, perhaps, we do not regret this at all. Graham Sutherland did one of my favourite portraits ever of Helena Rubinstein. I beleive it went up for auction recently and it was quite reasonable. How fascinating.We do not actually know of the Helena Rubinstein portrait but are interested to find out more. It seems to us that at the moment the art market is as volatile as the Stock Market. England Swings (Like a Pendulum Do)... My parents remembers the 1960's with a rosy glow! I was born in the grim 70's all I remember of that era is the endless power cuts and listening to the radio by candle light. I saw Danny La Rue perform at the Winter Gardens, Blackpool in the early 2000's he must have been pushing 80 then, kicking and flinging with The Tiller Girls. I wish you safe travels! one of your best posts ! You are the 60's Revai-bury group and no doubt revellers who swoooned and swayed around Mayfair and the swankiest haunts in happening London at the time. I feel there is a book here and perhaps a play. Bloomsbury group please move aside, you have had more than your share of limelight. What exciting times with such renowned artists (heart palpitations) Coventry Cathedral will be on my agenda when next in London.The Indigo Jones Pavillion is calling me to paint it. Wishing you a safe and joyous trip as you travel though Europe bringing joy to all who encounter you. Oh yes, how well we remember the grim days of the 1970s with the whole country, or so it seemed, on strike and the endless power cuts. Your seeing a rather aged Danny La Rue is not dissimilar to our attending the 'final' European concert of Marlene Dietrich in Coventry, of all places. She was, by then, sozzled and not to be parted from the gin bottle. Another time and another place. But it was all great fun at the time. And not without interest too! That is most kind. Good luck with the Flower Show! Would indeed that it were Lord and Lady!! Something which, so far, HM The Queen has failed for reasons quite beyond our wildest imaginations to bestow upon us. And all the while we are thinking that we would make the most suitable of Peers of the Realm. An oversight, we are sure. But thank you, Helen, for recognising our due!! They were indeed the most wonderful and interesting times but, as we so often say, if only we had really appreciated not only those with whom we came into contact, but also the value of their work. But, as we all know now, there is no telling the young! We are looking forward to our time in Brighton but even more so our return to the Motherland. What a delightful Post, full of wonderful memories. Your comment has amused us greatly but it is one with which we entirely agree! How lovely that you share these memories with us. How nice that you were able to reacquaint yourselves with someone from the past in lovely surroundings. P.S. re: your comment on my post, a good book is always a pleasurable pastime. your sheer volume of posts here and on a whole variety of blogs staggers me. I have not decided if there in fact 14 of you working under 2 names or that you are insomniacs with fast fingers! It is so strange how years go by and one forgets so many people and places but then a trigger will bring it all back again into clear focus. And yes, so good to catch up with old acquaintances although, in general, we do not favour revisiting the past, believing it best to look to the future. How pleased we are to intrigue!! Just the two of us, not fourteen, with an unsatiable level of curiosity and a need for only a few hours' sleep!! It does help that we have no children, pets, farm animals,employment, chores or housework!! Oh, your life during the 60s sounded full of creative folks. The gallery was a meeting place of the best. The U.S. had many places similar to those in your country. Bohemianism flourished at the end of the 50s and into the early 60s -- fun for me in the U.S. as well as for you in the UK. These did seem to be very creative and exciting times the world over. We are, of course, not nearly so familiar about the American equivalents but can well imagine that there was much fun to be had too. Perhaps, Barbara, you may be persuaded to write about it one day? You do move in glittering circles! The London art world in the 1960s must have been a very exciting time. I am sure your memoirs would make for a fascinating read! I so enjoy your blog, your posts are like a window into an extraordinary new world. Many thanks for this post! At the time, so much was taken for granted or, rather, so much of what was really valuable was overlooked for things infinitely more transitory. Such is as it is when one is very young, perhaps!! Thank you for your kind and generous words. How we love too looking through blog windows into the lives of others. You can both brief a sigh of relief. I realise that you have been anxiously awaiting a comment from this very shy and extremely unknown blogger, KLAHANIE. So, me being that blogger, shall dazzle and delight you with a well meaning and sincere comment. Right then, a fascinating and informative posting with very nice photos and accompanying captions. You know, I just love your blog and hey, thanks for leaving a very nice comment on my shy and humble blog. It's always a most flattering surprise to receive a comment from one of the blogging elite. With respect and a Chelsea Pensioners CD, your way, Gary and co-starring Penny the Jack Russell dog and modest internet star. Now we can rest easy in our beds knowing that the blogger who dazzles has been, seen and thrilled us with his kind and generous words. And, as you well know from your own travels, internet connections may not be all that one might wish and so, perforce, gratification in the form of our next post may well have to be delayed. However, we are delighted that there is such a marvellous CD to look forward to in the post or will a Chelsea Pensioner deliver it in person? Do say that this will be so....!!! Aha, very clever. Ask me a question and you get a follow-up comment from your biggest fan. "However, we are delighted that there is such a marvellous CD to look forward to in the post or will a Chelsea Pensioner deliver it in person? Do say that this will be so....!!!" Okay, to answer your question, all of the Chelsea Pensioners will deliver it in person and sing all their hits. Wait, it gets better, Catherine Jenkins, who also sings on their CD, will give you an extra added dimension of a bit of Welsh singing. There you go and I'm very impressed with your usage of the exclamation mark for added dramatic impact. Well done, you two !!! This blog and you are thoroughly charming. It seems only a little trip of time since you visited my blog - recommended by Edith Hope (who I, actually, think of almost every day and miss with an ache.) I'm sorry it's taken so long to come and visit. I suppose - "everything - in it's time and place." I am going to go and press the magic button to become a follower. I'm looking forward to reading more! Not just one but a whole hospital of Chelsea Pensioners and, as if our cup was not running over enough, Catherine Jenkins to boot. The hills, or should we say the valleys, will be alive with the sound of music. And, should Julie Andrews be persuaded to turn up too, then our lives really will be complete!!!$$!! We must now away to your supercalifragilisticexpialidocious blog in order to make our reply. How delighted we are to welcome you here and to have you as a Follower. We had assumed, quite wrongly so it appears, that as you had made no reply you were not wishing to continue with the business of blogging which can, we fully appreciate, be so very time consuming. But, as you say, a time, a place, a season for everything and now we are connected. We shall now,immediately, come to visit you and to return your wonderful compliment of signing up as Followers. Yes, we do so agree with you that the 60s were a very good time in so many ways. Perhaps the first decade in which the War was no longer in the immediate past. How very interesting to have been in Rhodesia then although, and here we may have our dates completely wrong, were they not somewhat troubled times with Ian Smith and UDI? But what a very, very sad state that lovely country is in now. And how much worse it must be for you. How is it possible to be homesick for a place that was never one's home? By the way, I still would classify you as Bright Young Things, whatever your ages now may be! Oh, what wonderful and interesting people you have known...all so creative and unique in their own right, and all ones to leave very favorable memories with you to enjoy today...such a gift! Indigo Pavillion is just beautiful by the way...to think, you have been there! The last photo is so magnificent, mysterious, and absolutely amazing. It doesn't assume anything realistic. More of a scene from a play. I wish you a great trip around Europe. Keep us posted! Perhaps it is less a matter of homesickness and rather more one of yearning, mixed with nostalgia. Could anything be kinder than your remark about the Bright Young Things? We take it as a huge compliment. The memories, as you point out, are very real and are there at all times to be looked back upon. But we are equally fortunate to count among our friends today so very many highly creative and interesting people. We shall most certainly be on the look out for you across Europe!! Have great fun with your students - which we are sure that you will. 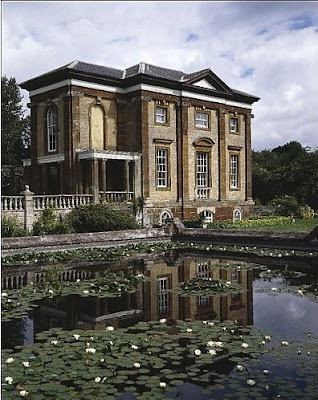 We do agree about the Inigo Jones pavilions of which there are a pair, all that survive of a much larger house. Our trip across Europe, as you generously put it, is in fact no more than overland back to the UK. But we do pass through six separate countries. Thank you so much for your comment. We shall very much hope to welcome you again in the future. In the meantime, have a happy weekend! Sending good wishes for a safe journey and gratitude for this beautiful and fascinating post. We are so pleased that you are enjoying life in the country. Happy weekend! how absolutely facsinating...as ever....what lives you've lead and what adventures are you still to embark upon!! Life, as we are sure you will agree, is an adventure. But just at times it becomes something of a roller coaster which, occasionally, it would come as something of a relief if it would slow down a little! I just finished Connie Willis' "To Say Nothing of the Dog", which centers around a renovation of Coventry Cathedral, so how neat to actually see it. How very intriguing this sounds. And whilst we do not know of 'To Say Nothing of the Dog', we shall certainly seek it out when in the UK. I can’t get over that beautiful picture of the Stoke Pavilion. And yet the scene seems rather desolate, a point underscored by the blind window. Would have loved to have been there for that. As a child of the 80's I sure do feel like I missed out on some things. Btw, I love that painting. Yes, the blind windows do give something of a melancholy appearance to the pavilion. It is, in fact, one of a pair which were, originally, connected by Stoke Park house, and are all that now remain. Since Robin Chancellor's death in 2010, the whole place appears to have become a wedding venue. Thank you so much for your comment which has enabled us to discover your own fascinating blog. Whatever, they were most interesting and fascinating times but then, as now, one is seeing it all in retrospect. Who knows that future generations will not be saying the same of the 80s and 90s in due course, if not already?!! Thank you so much for visiting and becoming a Follower. We are delighted to have returned the compliment and have added ourselves to your legions of Followers! Thank you so much. Sadly we fear that the weather in the UK is not nearly as good as it is at present here in Hungary. We are delighted to welcome you as a Follower and hope that you will continue to find interest in what we write. Thank you for a different view of artistic life in 1960's London. We impoverished art students in Canterbury were attracted to Pop Art exhibitions at the Tate and Biba on Kensington Church Street, like bees to nectar, whenever we could afford the train fare. Michael Craig-Martin looked like Mick Jagger then and, metaphorically, tore my paintings to shreds when he came down to lecture. Quentin Bell occasionally drifted past my easel with a benign smile. How interesting to have been an art student in Canterbury during the 1960s. It is so true that London at that time did seem to be the centre of the universe and to be based there was indeed exciting. Although, with hindsight, one did not fully appreciate the prodigious talent of so many artists at that time. As you say, if only one had the time machine!! We have been delighted to receive your comment since, through that, we have been able to see your most eye-catching and interesting blog. We look forward to making many happy returns to your blog and hope that we shall welcome you here again. Have fun on your trip -- already looking foward to your next photos. Thank you for your kind wishes. Although we are just doing a round trip to the UK, we do pass through six countries on the way. I love Coventry Cathedral and the stunning artwork you are showing "Le bois de Boulogne" is most interesting...there's so much happening in it, so much movement and so much talent coming out of it, I love it! what a fascinating time you lived through!....London was the beginning of it all!....i so love the painting!...such verve and enthusiasm....a tour through Europe would be fabulous...i so hope we will see pictures from your journey.....Enjoy! Thank you so much, Claudia, for the good wishes and we do hope that your busy period has proved to be profitable. These are, indeed, such uncertain times. For a modern cathedral Coventry, when we knew it, was very much ahead of its day and contained some wonderful art works. Sadly, we hear that the fabric is not standing the test of time. As you say, Susan, it really was all happening in London in those days but, at the time, we all took it very much for granted. Our tour through Europe should not be exaggerated as it is, in reality, the long, overland journey back to the UK to check on things there. However, in total we do pass through six different countries! Indeed.. a wonderful blog and all the posts are wonderfully written, expressed and explained. I like the choice of words that you use to elaborate your views which is quite amazing. Being a follower to your blog will serve me a purpose as I will know how you perceive things which sometimes.. which usually .. which normally... people often overlook. What a wonderful set of memories to share. The art looks fabulous (and the painting by Jean Dufy reminds me of the work of Ludwig Bemelmans, author of the iconic and much beloved Madeline books). Your photos of the beautiful architecture of Europe continue to astonish me. I always come away from your posts feeling as though I have dined on a most delicious visual meal. :) Thanks and I hope your journey to GB is/was smooth, and eventful only in the most positive of ways! I am so happy that I 'discovered' your blog. I really enjoyed reading your post - you both have a way with words! "Mere Pucks before Oberon" - I know the feeling. Happy travels, excited to see what you share next. Wonderful post! And I wish you both a blast when visiting the spectacular sights in Europe! Thank you so much for your very kind and generous comment. We are delighted to welcome you as a Follower and have been pleased to return the compliment. We hope that you will continue to be interested in what we write. The point you make here about understanding peoples' ways of thinking is indeed one of the most significant things,in our view, of what blogging brings. So many different views, ideas and cultures and a global perspective. We find it all fascinating. Yes, we think the art fabulous now too. At the time, although one was aware to some degree of these most talented artists, one would now pay much more attention to them and their work. Such is youth! We have not heard of Bemelmans or the Madeline books and so that is something which we shall certainly pursue. We have a great fondness for Dufy's work, so vibrant and expressive and so other works in that vein would, no doubt, be very appealing. We are so pleased to welcome you as a Follower and through your most kind comment, we have also found you. We have been delighted to return the compliment as your own blog is full of interesting and varied posts. We smiled at the idea that you too knew the 'Pucks before Oberon' feeling. We try now to only dance to our own tune!! How pleased we are that we 'popped up' as we always look forward to hearing from you! We love your metaphor about the felled tree. It is so true that although as time passes one forgets so much, nevertheless, some things from one's early days make such an impression that it only requires the smallest jolt for memories to come flooding back. We have now reached Brighton and all is well. However, on travelling through London, certain parts looked like a war zone after the rioting. So sad. Oh good, I am glad to hear that you both arrived safe and sound! I would be very curious to hear what you think about what is going on--and the point of view of the amazing group of friends here. In my exhausted state, I didn't put two and two together that you quite probably passed through France! Yes? No? I hope that you would have let me know if you were anywhere near Provence!!! Thank you so much, Heather, for your kind concern. It is very difficult to make any sense of what is going in the UK at present but whatever it is all very frightening. The scenes through London were almost unbelievable. Eerily quiet, boarded up shops, armoured police vans and police in riot gear by the thousands. Very, very disconcerting. Brighton, however, is delightfully normal with the Pride Parade scheduled for Saturday and rainbow flags everywhere! Yes, we did travel through France but only the North. We were due to visit our friends in Provence but did not feel up to the journey knowing that we also had to return to the UK. However, rest assured [or alternatively be very worried]Heather, we shall most certainly be in touch should we be coming anywhere near your door. And, of course, our door will always be open to you too!! To be young in London in the 60s...well, I know you would be fascinating whenever you lived, but really! What a fantastic combination - I read with mouth agog. Love the art, love the pavilion, love all the NAMES!! London of today may be providing different types of blogging material - keep safe and have a great trip. Yes, looking back, they were the most extraordinary of times, only fully appreciated now upon reflection. Perhaps that is usually the way since at the time so much is taken for granted. Such is youth! We were shocked by the scenes in London as we passed through onour way to Brighton. So much wanton destruction and an uneasy tension. A most unhappy situation. My dear Jane and Lance, I love every word of it. It's such a cultured post. I love Sutherland's works (his work reminds me of some of Francis Bacon's paintings but Sutherland is one of the most underrated painters). Ivon Hitchens's works are so painterly and he's one of my favourites. Hope you're both doing well. I shall look forward to your next post eagerly. I have been thinking of you this week and keeping you in my prayers. I am so delighted to read you are safely deposited in Brighton. Enjoy a rest and getting acclimatized to life in England. It always takes some time to adjust when moving to a second home. How wonderful to hear from you and thank you so much for your most generous comment. All of these most talented of painters we really admire now and really wish that we had taken a much more active interest in them and their work all those years ago. And, if only we had managed to buy one or two....oh, well!!! How lovely of you to be in touch, dear Helen, and for keeping us in your thoughts. Fortunately, all was well here in Brighton but we were shocked by the appalling damage to property which we saw as we passed through South London. We are only here for a short while and then shall be on the move again, but we hope to resume our normal blogging operations before too long. We do so hope that life on the beach is suiting you well at the moment and that you will still wish to know us once you are a true celebrity!!!! Dear Jane and Lance - travel through Europe you say...west or, perhaps, east? My trip has been an adventure and am happy to be heading home in the coming week. Tucking you both into prayer as you go. We have travelled West, dear Sandra, back to Brighton but shall soon be on our travels East again. We have thought about you often as you have been exploring pastures new and shall look forward to catching up on all your adventuresome tales. Safe return!! Jane and Lance~ I have not been blogging this summer, as my husband's health is failing rapidly. I am with him always. Today while he was sleeping I decided to check in and what a joy to visit your world. Thank you for a few moments of respite. We too have had a little break from the computer just recently and so are not completely up to date with everyone. We are so sad to hear about your husband's health as this is such a constant worry for you. We are pleased that our post offered a brief escape. What a glittering and artistic London crowd to have rubbed shoulders with! I have to admit I'm not aware of the history of The Pallas Gallery, but your post is fascinating and indeed one of the reasons why I love your blog so much is the way you evoke the sense of a different time all together .... love all those names! I hope you are enjoying your travels through the continent. Indeed, Jeanne, they were all such talented individuals but, alas, we have only really appreciated them with age when they were all, sadly, long gone. We shall soon be on our return to Budapest and although we enjoy our time away we really do think of Hungary as home. And there is, of course, nowhere quite like home!! As a semi-Bright thing in the sixties, I enjoy your reflections on that lost era of delight. 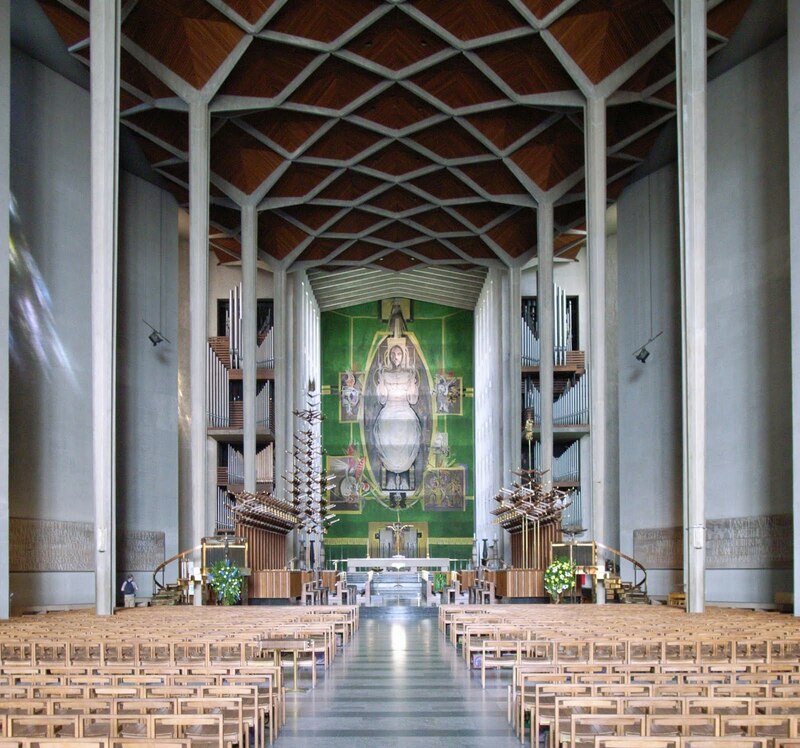 I remember all the fuss about Graham Sutherland's tapestry (which I quite like) but all the excitement about Coventry Cathedral passed me by entirely. (When they put a reclining Henry Moore right in front of my father's office, he did his absolute best to like it). Have a terrifically wonderful time in Budapest. Oh good - much as I hope you're enjoying your travelling, I look forward to your next post. Yes, those were the days and, as they say, if only we had known then what we know now....!!! It is many years since we were last in Coventry cathedral. We loved the scale and modernity of the Sutherland tapestry which, in our view, had a tremendous impact on the place. We understand, however, that it is now showing signs of age and that is such a pity. We have now returned to Budapest with, of course, more tales to tell!! We have now returned from our travels and shall soon be on the airwaves once more. We hope that you are enjoying the summer. Oh, London must have been even lovelier when it was "swinging", I love that era, the 60s and earlier. I'm learning a lot from you. A big hello to both of you! Right now in Rome it's close to 40 C, it's impossible to go out! Yes, London in the 1960s really did live up to its 'Cool Britannia' image. They were such vibrant and interesting times. Gosh, 40C sounds very hot indeed. Today it is well over 30C in Budapest and that is quite hot enough for us. We have just returned from England where it seemed like autumn and was quite chilly!! Another lovely post and set in a time that I so wished I could have been in. It was stories of 1960's London that made me dream of living there one day, which resulted in my moving there in the late 70's when I was old enough to move! I will be in London from tomorrow, and staying not far from Albermarle Street. As I walk along the street, I shall blow it two kisses for you how's that! London in the 1960s was indeed a magical place. However, London at any time always has something of interest to offer we feel. We hope that you will have a wonderful time in London and what fun to think of you passing my our old stamping ground of Albemarle Street. We have no idea what has replaced the Pallas Gallery now but Brown's Hotel is still there and is always worth a visit. Have a lovely time! Absolutely! I agree, London always, always has something to offer and at times I miss home terribly. Dr Samuel Johnson said it best didn't he! As I walk along Albermarle Street, as well as blowing two kisses in the air, I shall endeavour to find out what occupies 28b! Yes, Dr Johnson cannot be beaten when describing London!! We are most interested to know what 28b Albemarle Street has become and look forward to your reporting back. We love the idea of kisses in the air and shall think of you doing just that!! Thanks so much to the both of you for the lovely comments on my page.Truly appreciated.hugs! It is always a great pleasure for us, we do assure you. Thank you Anita for replying and wherever your comment appears we shall find it!!!! Have a lovely weekend. Wall to wall blue skies here and we hope the same with you. How really sweet of you to have even thought about it, let alone taken the time and trouble to write following your recent time spent in London. Far more importantly, we do hope that you had fun meeting up with your friend and that you were able to do some of the things which you wanted. Hours spent in London do, we know, fly by. Such an interesting post for so many reasons. I didn’t know that one of my favourite painters, Raoul Dufy, had a brother who painted in a very similar style…fascinating. How do you feel about the modernist structure on the ruins of Coventry? I know it isn’t a perfect solution, but I’ve seen such superb reconstructions of bombed churches and palaces in Dresden and Russia, that I think in the long run, though much more expensive and difficult, I prefer them. Would so enjoy a wee post of your recollections of the Marlene Dietrich concert you attended so many years ago. 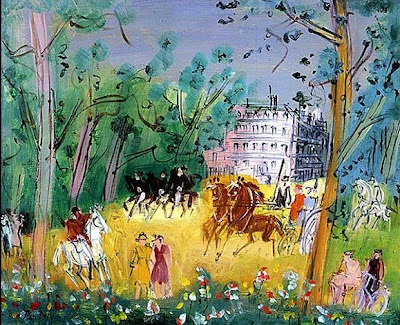 There were several original works by Jean Dufy at Pallas Gallery [he was most likely a favourite painter of Andrew Révai] and although Raoul was published ['Drying the Sails' Tate Gallery] we have no recollections of seeing his work at the time. The new Coventry Cathedral works for us to a degree although we were always inclined to think that somehow the materials of construction would not endure quite as they should. This, apparently, has been the case resulting in a kind of 'cheapness'. We have yet to visit Dresden, high on our list. Maybe a post about MD!! Certainly worth a thought.